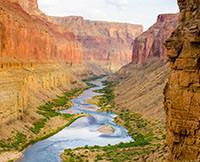 Whitewater Rafting in Grand Canyon – superb! The highlight of my Grand Canyon Rafting trip was the ability of our guides, Lucky and Erica to not only make it fun and interesting, but to impart history and geology lessons as we went down river. They made the trip what it was! Absolutely superb! A once in a lifetime experience.